Will "Uptown" Stick as Boston's Newest Neighborhood Name? Will Boston residents and tourists be referring to the area around TD Garden as “Uptown” in the future? That is what Boston Properties and Delaware North, the developers of The Hub on Causeway are hoping will happen, according to a recent article in The Boston Globe. The area goes by a few names now, depending on who you ask. Is it the West End? The North End? The Bulfinch Triangle? 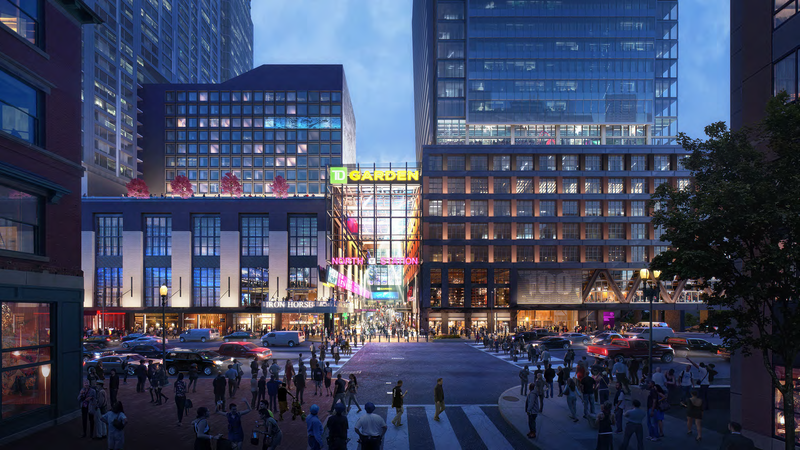 The developers have been pushing “Uptown” for over a year now, trying out a new name to go with the new mixed-use retail, office, hotel, and residential development at North Station and TD Garden. What do you think? Will “Uptown” stick as a new neighborhood name in Boston? Vote in our poll and add your comments in the section below. It may stick with some of the newcomers, but I think everyone else will probably just refer to it as North Station. I have always known it as the North Station area, but if you want to get geographically correct, then it probably should be referred to as the West End. Uptown to me is up Washington Street way. I agree with Belle — North Station is appropriate. That area seems downhill, you know, driving down Congress. Going up Congress = uptown. North Station is a T stop not a neighborhood Heather it’s like saying Uptown Station and the neighborhood being North Station. The area is known by the name North Station and it should remain that way. The area is known as the West End has been and always will be, North Station is not an area it’s a T Stop. I think it should remain the West End it’s historic and it’s fair enough, Uptown sounds bogus and weird. It’s bad enough that some people i knew from school didn’t even have an idea of what the West End is and then on Facebook I see this stupidest post with a slick caption someone reposted if your town is not on here then your not from Boston it had of course two not listed the North End and the West End. Why change it ? And you got the West End Museum too. Uptown is not a formal name for an area. We say “let’s go uptown” — that’s how it is used. North Station is the area. West End is something entirely different. It does NOT include North Station. West End area encompases MGH and the West End Library area. How is this not the West End? Calling North Station “Uptown” is nonsense. The developers are trying to rebrand it so they can market the project as a new, up and coming destination. It fits with their desire to make as big a profit as possible (as any business would). Marketing this new development as the West End doesn’t fit with the high end luxury residences and commercial space tenants they’re looking to attract. The reality is they can try to doll it up all they want, but it’s still North Station. It looks great, and will be great for the all the restaurants/bars in the “Bullfinch Triangle”, but “Uptown” will fail…….because it’s North Station. You are so right — Uptown is nonsense. North Station is the area. The former Madison Hotel, North Station, etc. Uptown is a name of a Prince song. That area of the TD Garden is not Uptown at all. Leave it as North Station or West End. Uptown would be west of Washington St towards Beacon Hill, Copley Sq. etc. It’s properly the WEST END!!! Ann, truth be told there is no West End and there hasn’t been one since the city demolished it and displaced most of the residents . It is the Bulfinch Triangle Section of the West End. Unfortunately, I have had heard more than one person, including someone who live there, refer to it as part of the North End. North Washington St is the dividing line between the North End and the West End. When the Strada building was being developed the North End fought to prevent residents of that building from getting North End Resident parking stickers and the city agreed with the North End. North Station in in the West End. It’s the same as when some realtor lists Stillman St as THE WATERFRONT. Why do all the “New” developers insist on changing EVERYTHING ?? The unique areas here in this part of our city had a local and historic flair~~~~~~maybe the reason why new people were drawn towards these little areas !!! I don’t think ANYONE should even THINK of just ERASING history !!! How could we ever again give the tourists driving or walking directions ??????????? I’d like to remind you, Janet, that the section of the North End in which you now reside was once referred to as Ghost Town. No North Ender would have said Fulton Street was part of the North End in 1970. Things ~~change~~. It’s better than the former name, ghosttown. Downtown Crossing is a T stop and an area. Same thing with North Station, at least in my mind. I always thought that Uptown was the Copley Square – Newbury Street area and Downtown is what is now know as Downtown Crossing! Anonymous: The term “hippies” is old school – throwback to the 70’s. . Use Millennials or Generation X. You are aging yourself ! I get tired of NYSE listed companies telling us what to call city landmarks and locations. They can name their developments whatever they want. TD – Bank North / Whoever they take over next, is rediculous. It will always be the Boston Garden. As far as I’m concern, they can take their marketing schemes and dirty graft money elsewhere. a.lways referred to as North Station which was considered part of the NorthEnd The West End started after the ONeil Bldg. There was No Bulfinch Triangle(another made up name) Parked in this area with a NorthEnd parking sticker till the entire area was somehow annexed from the NorthEnd May have been a way to do away with the NorthEnd 55ft. height restriction City Hall (a windowless, light deprived depressing place) should have old records on file which show the boundary lines between the NorthEnd and the Old WestEnd neighborhoods. Just drove through there this morning on the way to MGH. The “Welcome to the West End Sign” is on a traffic island right after the O’Neill Building. Maybe they should call that area “No-Man’s Land”? Charles Bulfinch designed the streets in 1807. Before that the area was a marshy tidal flat called Mill Pond/North Cove.